In May 2015 verd de gris developed a short pilot project to look at how we could support cross-community working with groups of vulnerable women in Calderdale. This pilot led to the very successful ‘Recovery’ project Behind the Mask which gave support to local women dealing with poor mental heath and related social issues. verd de gris maintained a strong bond with seven of these women and so as part of Creative Communities initiative we developed a 2-day intensive retreat with them and other local women recruited through an open call via local networks and social media. We wanted to create a neutral yet creative space where the women could relax and spend quality time together without judgement – the diverse make-up of the group meant we had women of differing socio-economic, religious, racial and sexual orientation. 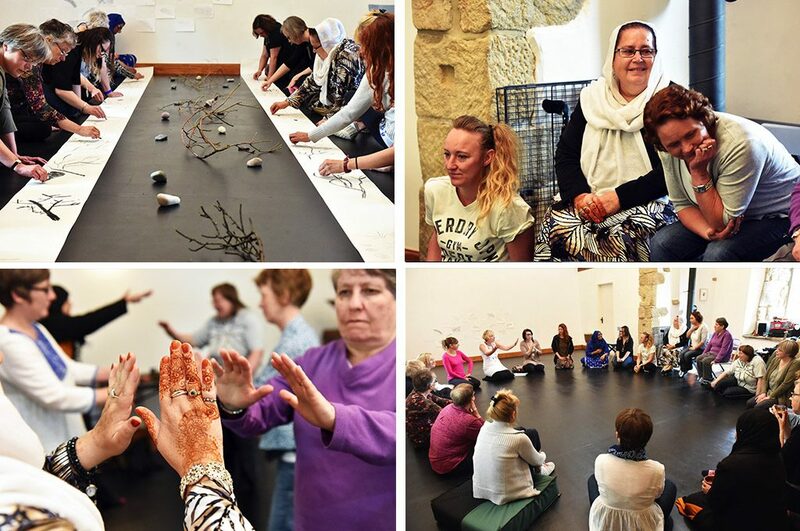 Sharon and Natalie from verd de gris worked with musician Amy-Rose Atkinson and combined art forms to ascertain what ‘freedom’ meant to this diverse group of women – how did their notion of ‘difference’ affect them and their sense of feeling ‘free’? The space and the mood created led to very open conversations about e.g. meeting others from different backgrounds; the importance of recognising the things they all shared as women; and the positive of recognising and celebration of ‘difference’. The impact on each of the women was quite profound and very moving to witness. For all the women, their understanding of ‘difference’ deepened and was enriched.